Engineers are always looking for a better, faster, cheaper way to execute their processes. That’s what they do. So in the late 1990s and early 2000s, cardboard, or corrugated paper started replacing wood in various packaging applications. And naturally, pallets needed an upgrade. Ikea continues to be our case study for switching from wooden pallets to corrugated paper pallets, saving $193 million per year (10 percent of total) in transportation costs alone according to Change the Pallet. If cost isn’t enough, what about sustainability? Ikea also projected to reduce 20 percent of CO2 emissions per cubic meter of products transported over 5 years. Let’s take a look at what the true differences are between wood pallets and cardboard pallets. The standard dimensions for a wood pallet are 48 x 40 inches but can range from 30 x 30 inches to 48 x 48 inches. Regardless of the exact dimensions, wood pallets are always rectangles. Corrugated paper pallets are totally customizable to your needs by shape, size and durability including weight loads, sizes, and stack heights. Typically you can choose from low profile pallets, light, medium and heavy-duty constructions, all with die cut options to customize the top sheet to the product being shipped. 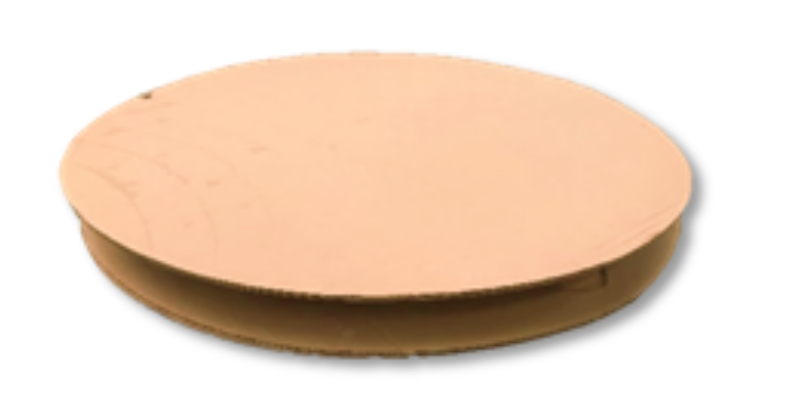 Are you shipping a round product? You probably want a round pallet to ensure weight distribution and maneuverability around the product, about 1440 pounds of savings on a 45-foot export shipping container. Because cardboard pallets weigh significantly less than their wooden counterparts, they are ideal for delivering freight and fuel savings, with more room for your product in each shipment. Because cardboard pallets weigh significantly less than wooden pallets, they are much safer for workers to handle. In addition, nails, staples and splinters all come with their own safety hazards and are only found on wooden pallets. Additionally, wood can start off with contaminates like insects, fungus and bacteria. Of course, insects can make their way into anything, but because wood has often not been heavily processed, it contains much of its original environment and ecology and requires heat treatments and fumigation to be usable for international shipping and other food, health and safety requirements. Corrugated paper starts as a sterile product, so the only contaminate worries become what the pallet picks up from its post-process environment. Paper pallets do not require these treatments to be 100 percent sanitary and are well-suited for clean room environments. Plus, these corrugated pallets are also made with non-wicking cores for added stability and moisture resistance. Using corrugated paper pallets can reduce the hazardous materials in your facility and around your product and employees. To recycle wooden pallets, you must take them to facilities that can shred the wood. The recyclers must also have access to metal separating tools like a magnet to separate out the nails and staples for recycling. This can quite costly. On the other hand, feel free to bale your paper pallets alongside cardboard boxes and other corrugated packaging products. This can lower your disposal costs and can generate revenue upon proper disposal. 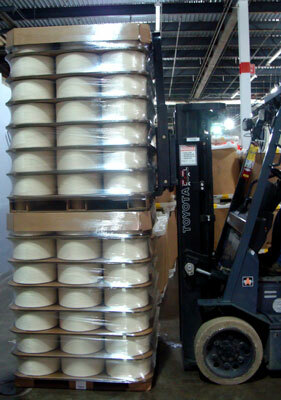 This is a big bonus for corrugated pallets since they can generally only be used for one trip. Learn more about our in-house corrugated pallets brand LoadRunner®.